The flu and the common cold are nasty respiratory illnesses with some similar symptoms. Here’s how to tell the difference. In the winter literally everyone seems to be getting sick. Your coworker won’t stop coughing and your kid keeps coming home from school a snotty mess, and a box of tissues barely lasts you one day. Contrary to popular belief, cold weather does not make you sick — but respiratory viruses (namely, influenza) do tend to peak during the fall and winter. In the US, flu season typically lasts from October to March. However, a nasty case of sniffles and aches during the winter doesn’t always mean you have the flu. Often, it’s just a cold, which you can get any time of the year. The common cold and flu are both contagious respiratory illnesses that can make you feel miserable, but they are caused by different viruses. Some flu symptoms may mimic a cold, but the flu tends to be much more serious and deadly — so it’s important to know the difference between these two illnesses. Obviously, only a doctor can diagnose you, but knowing how to recognize symptoms is always helpful. So how can you tell if your symptoms mean you have a cold or the flu, and what is the best treatment? We spoke to Dr. Tania Elliott, an allergist and immunologist at NYU Langone Health in New York City, to find out. Note: This article is for informational purposes only and is not a substitute for medical advice. If you have questions or concerns about your personal health, talk to a health care provider. The common cold — often called a head cold, chest cold, or just “a cold” — is an acute viral infection in the throat and nasal passages. Many different viruses cause colds (hundreds, actually) but rhinoviruses are the most common culprit, according to the Centers for Disease Control and Prevention (CDC). Typical cold symptoms are a runny nose, headache, sore throat, coughing, sneezing, and less often (and usually mild), body aches. A cold will typically last from five to seven days and sometimes up to 10 days, Elliott told BuzzFeed News. Colds are often relatively mild and go away on their own, but over-the-counter medications such as pain relievers and decongestants can help relieve the symptoms. As the name suggests, colds are pretty, well, common. Adults typically get anywhere from two to three colds each year, according to the CDC. Colds don’t usually lead to complications, but they can be serious for people with weak immune systems or underlying respiratory illnesses, such as asthma. Occasionally, colds can lead to secondary bacterial infections (more on that in a bit). How does the flu differ from a cold? The flu is caused by influenza A and B viruses, which circulate during flu season. Symptoms include a fever, runny nose, chills, fatigue, and body aches. “You may also get congestion and sore throat [like a cold], but that’s the least of your problems compared to how horrible and zapped of energy you feel,” Elliott said. The most noticeable difference with the flu is the onset and severity of symptoms, according to Elliott. “A cold will come on gradually. You may have some aches and congestion, but you’re still going to work...with the flu, it’s like you’re hit by a bus.” Another sign of the flu can be a sudden fever over 100 degrees Fahrenheit. Unlike a cold, the flu is more likely to lead to hospitalizations or complications, such as pneumonia, which can be deadly. The flu is especially dangerous for high-risk individuals such as the elderly, very young, and people with weak immune systems. Last flu season, an estimated 80,000 people in the US died from the flu and its complications, according to the CDC. What does treatment for a cold look like? When it comes to treating these illnesses, let’s get one thing out of the way: Neither the flu nor a cold is treated with antibiotics — they are infections caused by viruses, and antibiotics are used to treat bacterial infections. As we mentioned, most colds are generally mild and go away on their own, but it’s important to get adequate rest and hydration. (Here’s more info on how to deal with a cold symptoms.) Even though colds are caused by viruses, the symptoms can in some cases lead to a bacterial infection, which is known as a secondary infection. If your cold symptoms do not get better or actually get worse after 10 days or you develop a high fever, you should see a doctor, Elliott noted. “These could be signs of a secondary bacterial infection (such as a sinus infection) that developed on top of the cold.” In these cases, your doctor may prescribe antibiotics to treat the bacterial infection, although most sinus infections go away on their own without treatment. Also, it never hurts to get things checked out. If you genuinely can’t tell whether you have a cold or flu or you’re worried about your symptoms, consult a medical professional. “They can review your signs and symptoms and do a flu swab — if the flu is ruled out, they can still give you the right recommendations for over-the-counter medications,” Elliott said. When in doubt, see a doctor. Treatment for the flu is a little more complicated. Most healthy people who get the flu will have a mild illness and do not need specific treatment or medical care, according to the CDC. But it’s crucial to stay home and get enough rest and fluids, Elliott noted, and over-the-counter pain relievers can help you feel less achy. If the flu is caught early, it can be treated with antivirals — these are prescription medications that can keep the virus from reproducing in the body, BuzzFeed News previously reported. “If you seek treatment within the first 48 hours of [developing] symptoms, you can be prescribed Tamiflu or the new antiviral (Xofluza), which can lessen the severity and duration of symptoms,” Elliott said. In high-risk individuals, treatment with antivirals can prevent hospitalization or reduce the risk of complications. Most healthy people who get the flu won’t need antivirals, according to the CDC, but they are an option if you get diagnosed early enough. If you think you have the flu and you’re considered high risk, your symptoms become severe, or you are concerned about your illness for whatever reason, you should seek medical attention as soon as possible. The flu can become dangerous very fast and lead to serious health problems, so it’s always better to be safe. How can I protect myself and prevent the spread of flu and colds this winter? The flu and common cold are both spread through contact with an infected person or their respiratory droplets, which are produced when you cough or sneeze. These droplets can be sprayed into the air (then inhaled) or get onto surfaces such as doorknobs or faucets, which can then get on your hands. The viruses can enter the body if you touch your mouth or eyes. Good hygiene habits can help prevent colds and the flu, Elliott noted. For example, frequent hand washing — especially before eating or touching your face — is a good idea. You should also stay home when you get sick so you can rest and recover, but also so you aren’t spreading your illness to others. Elliott advises that people wait at least 24 hours after their fever goes away to return to work or school. The good news? The flu can also be prevented with a safe and effective vaccine. The flu shot isn’t perfect, and it’s possible to get the flu even if you’ve been vaccinated, but if you do, your symptoms will most likely be much less severe. The flu shot also prevents the spread of flu to others — including vulnerable people who are more likely to be hospitalized or die from the flu — such as young children, the elderly, cancer patients, or people who can’t get vaccinated for medical reasons. 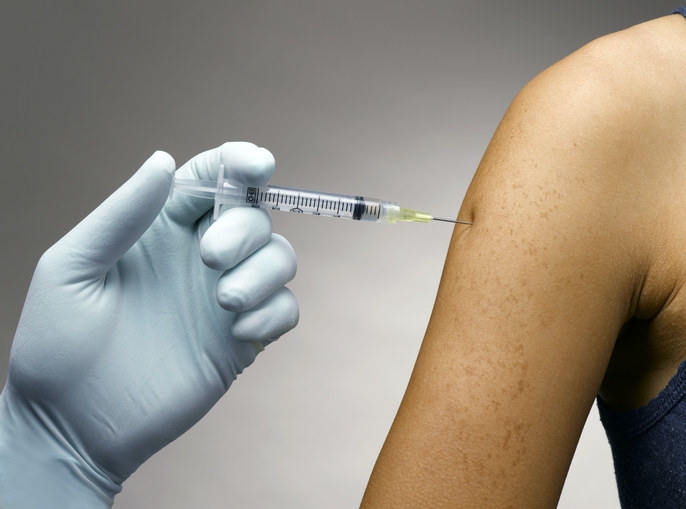 The CDC recommends just about everyone 6 months or older get vaccinated every flu season.